The entry, residence and work permit procedure for Luxembourg is fairly simple. All you need to do is to follow it step by step, regardless of whether you are a citizen of the European Union, an EEA country, Switzerland or a non-EU member state. The table on the next page highlights the steps to follow enabling you to closely monitor the progress of your application. It is essential to stick to this procedure to settle comfortably and quickly. The human resources departments of your host institutions can also help you in your application. Always stick to their expert instructions. Always be clear and accurate on your situation with the HR contact person in your institution. Are you coming on your own or with your family? (see 17 ) When will you really be available and able to start working in Luxembourg? remember that only complete applications will be processed. EU, EEA & Switzerland: Austria, Belgium, Croatia, Cyprus, Czech Republic, Denmark, Estonia, Finland, France, Germany, Greece, Hungary, Ireland, Italy, Latvia, Lithuania, Luxembourg, Malta, the Netherlands, Poland, Portugal, Romania, Slovakia, Slovenia, Spain, Sweden, the United Kingdom, Iceland, Norway, Liechtenstein and Switzerland. Third countries: They include all the countries not included in the list above. EU, EEA & Swiss national: You are free to enter, stay and work in Luxembourg. All you need to do is bring a valid ID card or passport, regardless of the length of your stay. Health insurance: EU, EEA & Swiss nationals have to apply for a European Health Insurance Card (EHIC) in their home country before travelling to Luxembourg. children birth certificates or family record book. A copy of the declaration will be issued as receipt. Possession of the receipt and AST provides proof of legal residence until the biometric residence permit is issued. the exemption of the work permit for Croatian citizens. Sworn translation: If the documents are not drawn up in German, French or English, they must be accompanied by a sworn translation. A sworn translation consists of the original text, the translated text and a statement signed by the translator or translation company’s representative, with their signature notarised by a Notary Public, attesting that they believe the translated text is an accurate and complete translation of the original text. 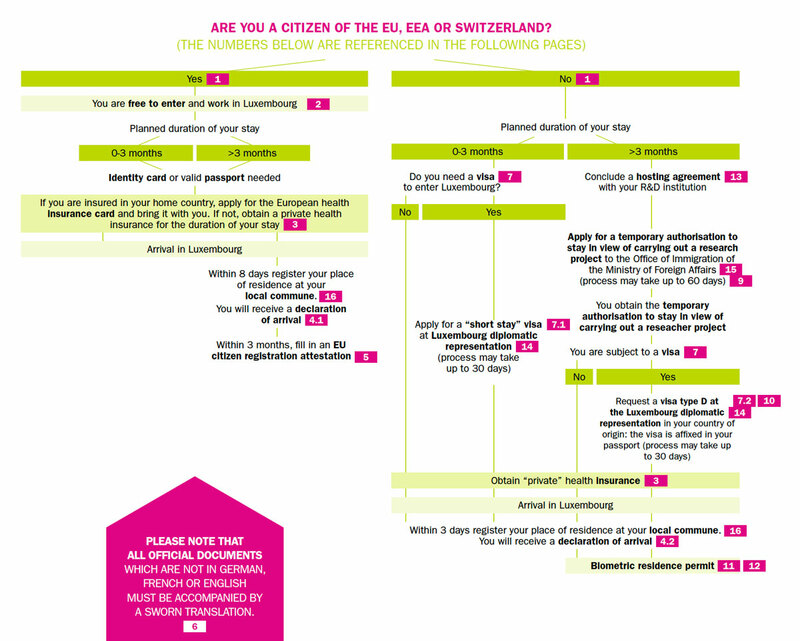 Visa: As a general rule, EU, EEA & Swiss nationals do not need a visa. Third country national however may need to apply for different visa types. or contact the local Luxembourg diplomatic or consular mission (see 14 ). This visa allows entry into the Schengen territory for a maximum uninterrupted stay of 90 days over a period of six months. The visa can be issued for single or multiple entries. In the event of multiple entries, the total duration of the different stays spent in the Schengen area cannot exceed 90 days over a period of six months. The Schengen visa is a short stay visa for business, tourist visits, family visits, etc. How to apply for a short-stay visa (Type C)? You should apply for a Schengen visa at the Embassy or Consulate of Luxembourg, if Luxembourg is the principal destination of your visit. Before travelling and leaving your country of origin, you must complete the Schengen visa application form and take it in person to a Luxembourg diplomatic or consular mission (see 14 ). health insurance covering the travel period. Third country nationals who are subject to a visa obligation and wish to stay in Luxembourg for more than 3 months must apply for a long-stay visa type D. If you are a researcher from a third country and you need a visa, the temporary authorisation to stay will facilitate the visa procedure (see 8 below). The ‘authorisation to stay’ is available for researchers in public and private organisations. Students are not eligible (if you are PhD student / candidate please check the procedure with the HR department of your hosting institution). A researcher is defined as a third country national holding an appropriate higher education qualification which gives access to doctoral programmes, and who is selected by a research organisation to carry out a research project for which the above qualification is normally required. What are the advantages of an authorisation to stay in view of carrying out a research project. family members can also apply for a long-term residence permit from their country of origin (if applying together with the researcher, the processing time should be the same) (see 17.3 ). STEP 1 - apply for a residence permit for carryingout a research project (see 9 ). STEP 2 - apply for a long-term visa if applicable(see 10 ). STEP 3 - make a declaration of arrival - whithin3 working days from the date of arrival in Luxembourg(see 4.2 ). STEP 4 - apply for your biometric residence permit -within a 3 month period (see 11 ). 9. How can you obtain a long-term visa/temporary authorisation to stay in view of carrying out a research project ‘autorisation de séjour pour mener un projet de recherche’? How can you obtain a long-term visa/temporary authorisation to stay in view of carrying out a research project ‘autorisation de séjour pour mener un projet de recherche’? Third country nationals wishing to stay and work in Luxembourg for more than 3 months need to apply to the Minister of Immigration, Direction de l’Immigration, B.P. 752, L-2017 Luxembourg, well before departing to Luxembourg. Agreement to cover costs (to be provided by the research organisation). Please note: The applicant must enter Luxembourg within 3 months of the temporary authorisation to stay in view of carrying out a research project being issued, meaning that the visa must be requested before the 3 months expire or, if there is no visa requirement, the entry must take place before the 3 months expire, during which the declaration of arrival at the local commune must be obtained. If the documents are not drawn up in German, French or English, an official translation by a certified translator must be attached (see 6 above). Only complete applications will be processed. Incomplete applications will be returned to the sender. The time required for a response from the Ministry of Foreign Affairs is generally a maximum of 3 months. The temporary authorisation to stay in view of carrying out a research project (‘autorisation de séjour temporaire’ or AST) will be sent by post to the address given by you on your application. It is valid for 90 days. 10. How to apply for a long-term visa? How to apply for a long-term visa? (check if you need a visa in point 7). In the 90 days following receipt of the temporary residence authorisation (‘autorisation de séjour temporaire’ or AST), you must submit, in person, a Schengen visa application at the Luxembourg diplomatic or consular mission (see 14 below) in your country of residence. the temporary authorisation to stay. When the Type D visa is granted, it is affixed in the passport as a stamp or vignette. It is valid for a period from 3 months to one year maximum. Now and within the 3 months period, you must apply for a residence permit. You must undergo a first medical examination by a Luxembourg doctor, followed by a tuberculosis test at the ‘Ligue médico-sociale’ (www.ligue.lu). The results are sent to the Health Ministry to check whether all medical requirements are met to obtain a residence permit. After your application and notification by the Health Ministry have been received, the Immigration Directorate will invite you to come to its premises with your valid passport to gather the biometric data (fingerprints, photo) required for your residence permit. Your biometric residence permit can be retrieved a few days later at the Immigration Directorate. You must then confirm your declaration of arrival at your local commune to obtain a residence certificate. IMPORTANT: Your biometric residence permit is not a travel document. To travel outside of Luxembourg, you must always have a valid passport and a valid residence permit with you. Once you have obtained your residence permit, you will have equal status to that of nationals of your host country in terms of pay and working conditions, access to goods and services, recognition of professional qualifications and social security. A residence permit may be granted to your family members for the duration of your residence permit. You can take up a teaching position. A ‘hosting agreement’ is an agreement issued by a public or private approved research organisation in an EU Member State, to undertake a research project. The research organisation can only sign a hosting agreement with a researcher if there are funds available for the research and they are satisfied with the researcher’s scientific skills. In addition, the researcher must have sufficient financial means and health insurance. Only a research organisation approved by the Member State can sign a hosting agreement. Once a researcher has a formal hosting arrangement with a research institution they will be granted a residence permit for one year or for the duration of the research project (if less than 1 year), and do not need a special work permit. However, an entry visa must still be applied for. Luxembourg diplomatic or consular missions: In countries with no Luxembourg diplomatic representation, you may also contact the Belgian or Dutch consular services. more than 3 months, registration at your local commune is compulsory. As family member of an EU citizen you must apply for a long-term visa at your local Luxembourg diplomatic representation with a view to accompanying or joining the family member in Luxembourg. The application must be made BEFORE departing to Luxembourg. Once you obtain the visa you can join your family member in Luxembourg. On arrival, you have to apply for a residence permit as the family member of an EU citizen (French: ‘Carte de séjour de membre de famille d’un citoyen de l’Union’) at your local commune within 3 months of arrival. Whilst waiting for this permit to be issued, you will receive a receipt as proof the application has been submitted, which is valid as a residence permit for a period of 6 months. The residence permit is sent to your local commune where it can be picked up. single children under 18 years of age on condition that the person has custody and they are dependent on him or her. Direct ascendants dependent on the resident applicant may be considered as family members when this ascendant is dependent on him or her and does not have the necessary family support in the country of origin. Well before departing to Luxembourg, researchers wishing to be accompanied by their spouse/partner or children (or person’s spouse or partner) under the age of 18, must include the documents required for family reunification in their own application for residence permit to carry out a research project (see 9 ). Extract of your police record or an affidavit. Proof of health insurance coverage in Luxembourg.